We’ve looked at a classic McLaren F1 supercar, and how you design a modern P1 hypercar, courtesy of McLaren’s legendary design head Frank Stephenson. But how do you actually build a car like this? 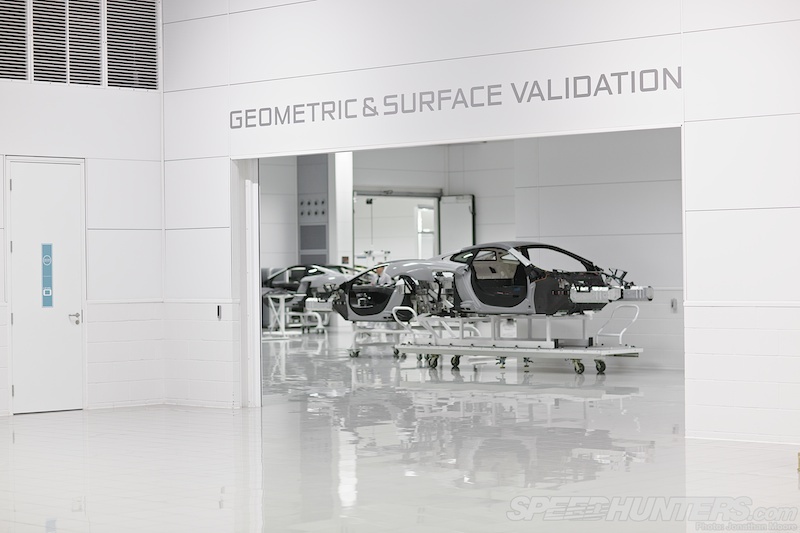 What does building a supercar involve once you’ve hammered out the technicalities, prototyped and tested the concept and moved into the production phase? …and then you end up with one of these. Every hour. 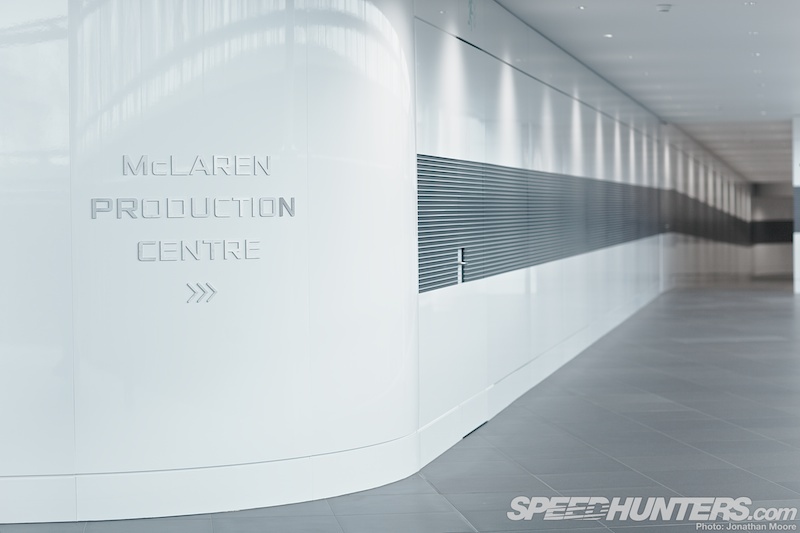 This is the new McLaren Production centre, the latest addition to the McLaren campus in Woking in the UK. 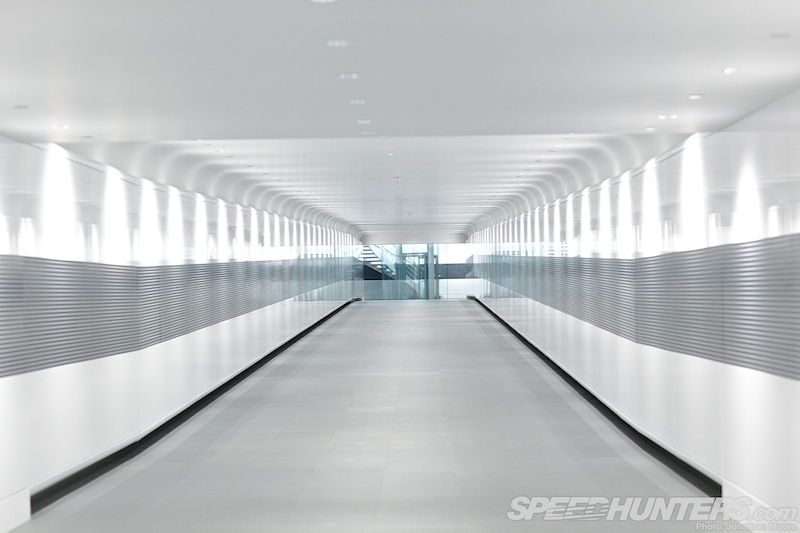 It’s linked to the original Technology Centre buildings by more sci-fi corridors, which just adds to the already future-now feeling at McLaren. 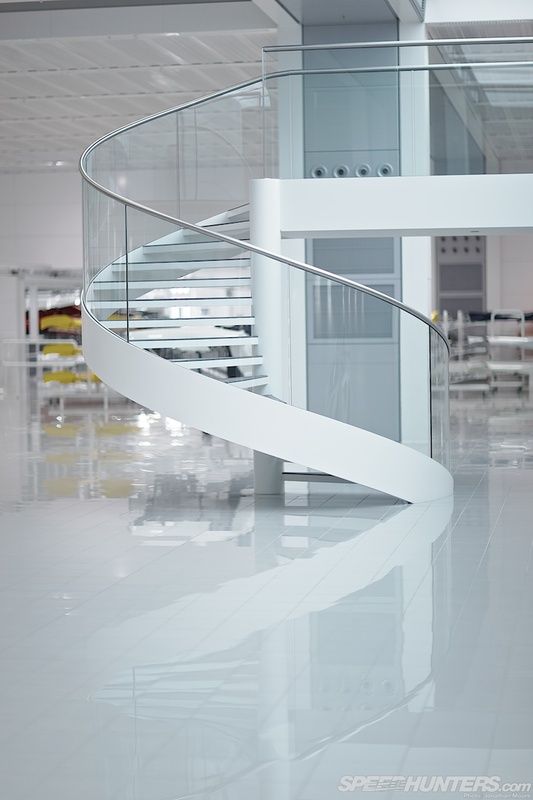 McLaren DNA runs through everything here. 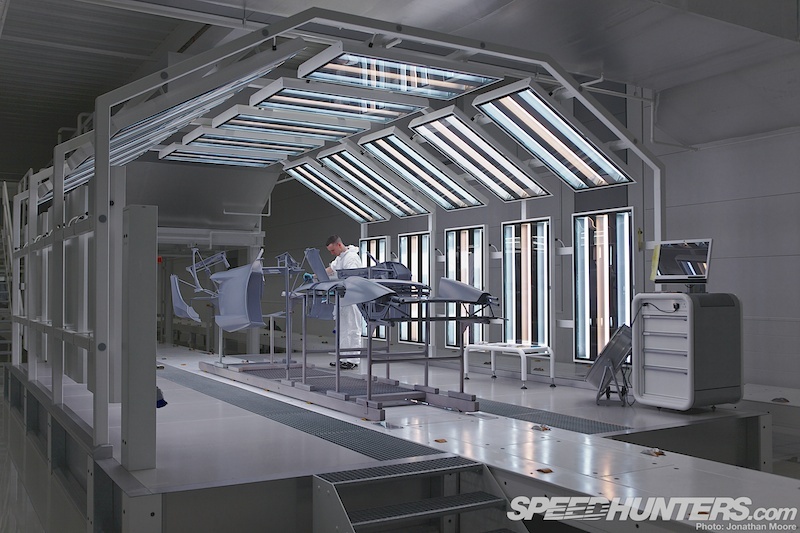 The MPC is another stunning complex; pure of design, futuristic and spotless, monitored and managed for the specific task of making road cars. 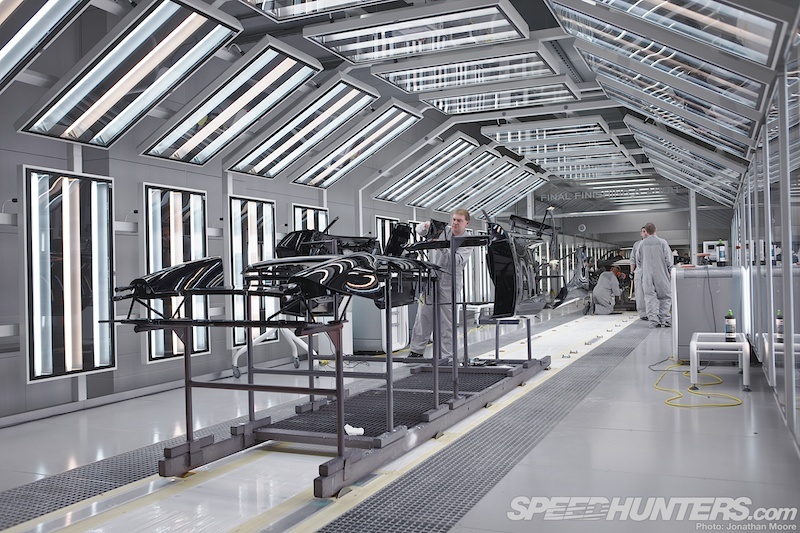 This is the home of McLaren Automotive. It’s a breathtaking place, where there are more 12Cs than you’d think possible. We all heard that McLaren were planning on building the 12C in serious numbers; well, a visit to the MPC proves they were very serious. 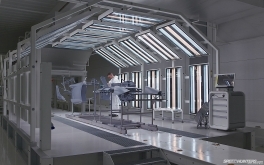 The MPC is enormous: predominantly open plan and with all the workstations built to a particular height: there are few things above eye-level except certain jigs – the idea is that you can always see across the entire area, and supervisors and specialists can spot small help flags that are put up if a particular station needs assistance. No shouting, no radios, just quiet, measured efficiency. 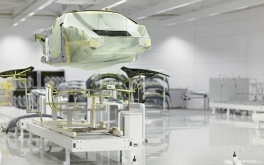 The MPC is also future-proof: it was deliberately built to be far larger than required, and the spare run down one wall was being prepared for the installation of the P1 production line. 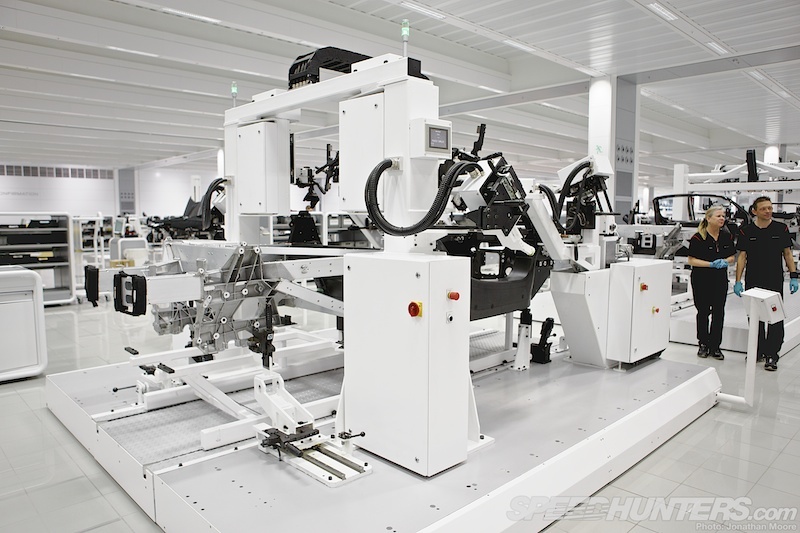 All the ancillaries were already plumbed in under the floor: the positions were sprayed, the tiles lifted – and voila: everything you need to install new machinery. But we’re here for the 12C. 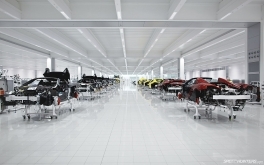 Nine interlinked production lines: from MonoCell gestation to fully completed birth and delivery, a 12C travels about a kilometre in the three and a half weeks it takes to build up. This first line comprises five stations, and takes the tub from bare carbon to skeletal form. The tub is bolted to a sliding frame that will be its support for this formative stage of its life. 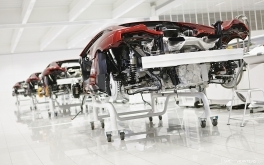 The initial step is to attach the main crash structures to the MonoCell at either end: these are the sacrificial stubs that will take the impact in an accident. 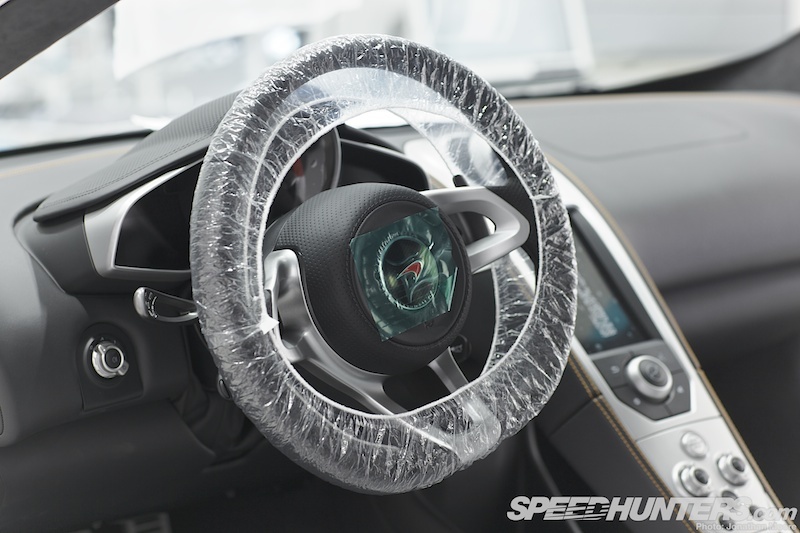 Is the attention to detail fanatical? No, just appropriate for the type of car we’re dealing with. At the second station the B-post casting rollover structures and windscreen are installed, which are the same for both the Spider and Coupé – a pretty unique situation. 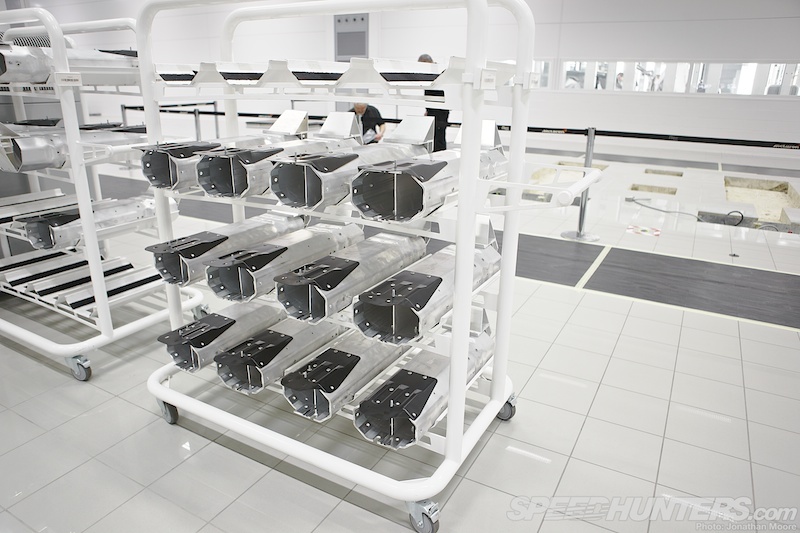 The jigs at each station are purely for accurate positioning: everything is then secured in position by hand, and there’s only one robotic interface in the entire build process. The required parts for each station are kept either in the lockers to one side or on bespoke tables, each with specific mounting points for the part being prepared. 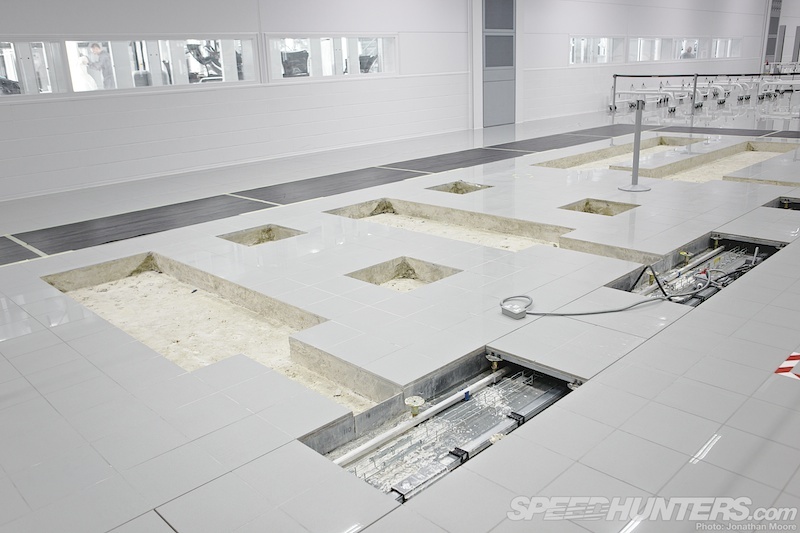 Individual sub-components and assemblies are fabricated on the floor below: there’s the entire same space again below the build floor for those tasks. Between each station is a holding bay: the clamps are undone on the sledge and it’s simply pushed into the holding area for alignment checks and to allow bonding to cure before moving to the next jig. 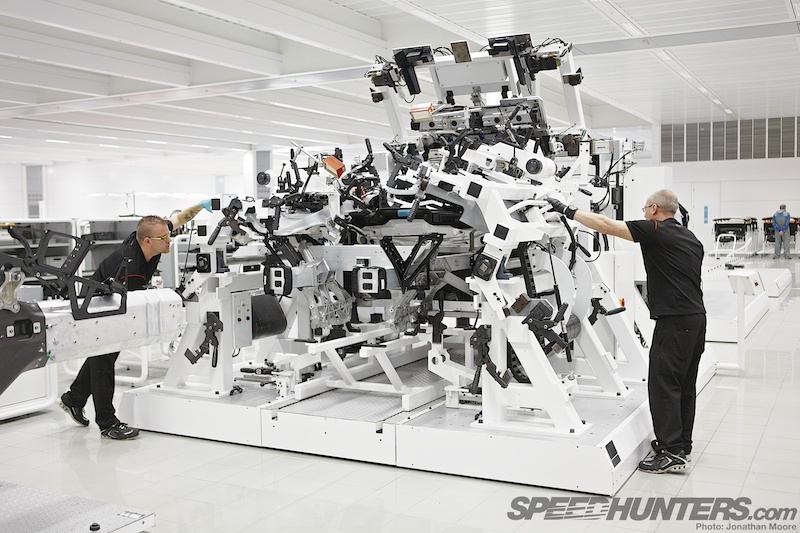 There’s limited time available: the team at each station have around 45 minutes to complete their task before the chassis has to move on to the next station: at this stage there could be almost 50 cars ahead of it, so timing is critical. Details, details. 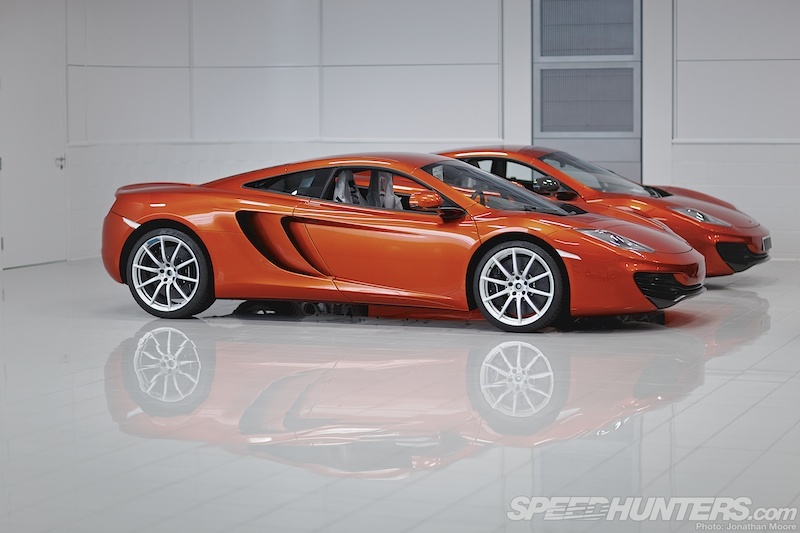 The sealant doesn’t have to be McLaren orange – but it is, of course. 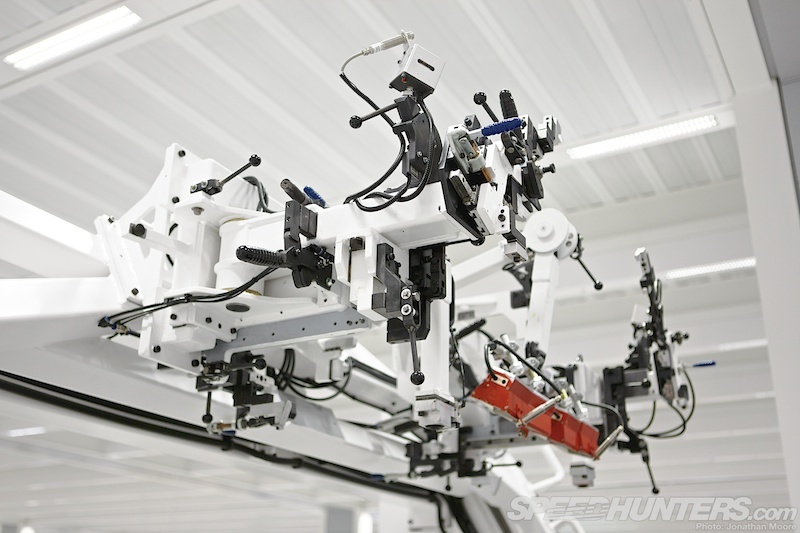 The third jig is fully mech-warrior, an absolute riot of tooling that requires some precision positioning by the crew to ensure they’re in the exact position required for each part to rotate into place. This station fits the rear quarters and the deck – the latter is the first differentiation between Spider and Coupé models. The final stage of this initial line fits the first sections of primed bodywork: rear shoulders, A-pillar covers and side sills. 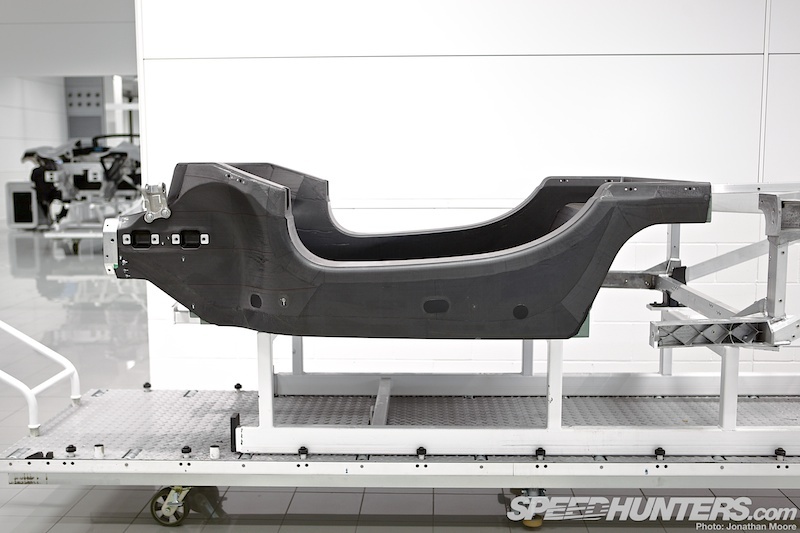 It’s when the shape of the 12C to come first emerges. Now the shell branches right into two separate spaces. First, measurement verification and then through for painting. Death Star torture probes of varying needle sizes buzz around the car in the Geometric & Surface Validation area – this is the sole robotic process that I mentioned earlier. Next up: painting time. 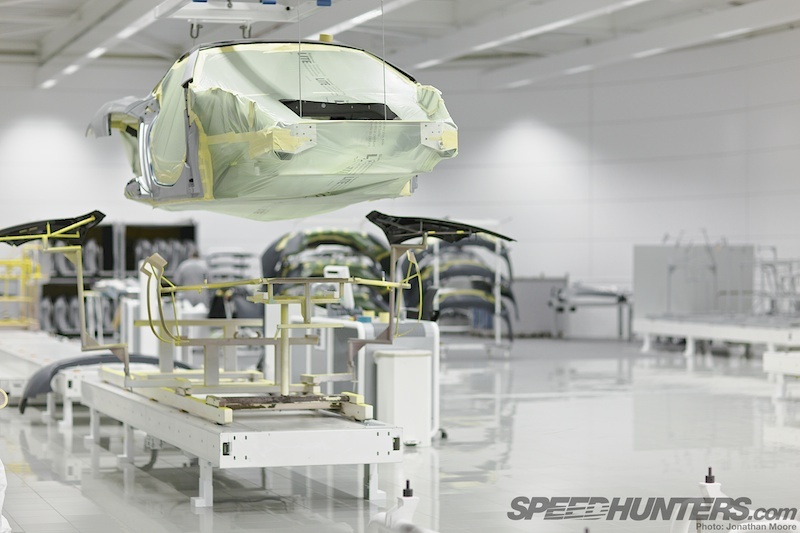 Each car is built to order, so therefore has its colour coded to its assigned production number. This in itself is a huge task with multiple stages. Delicate masking is the first step: the cars are painted intact, so three sets of coloured tape with differing width are used. 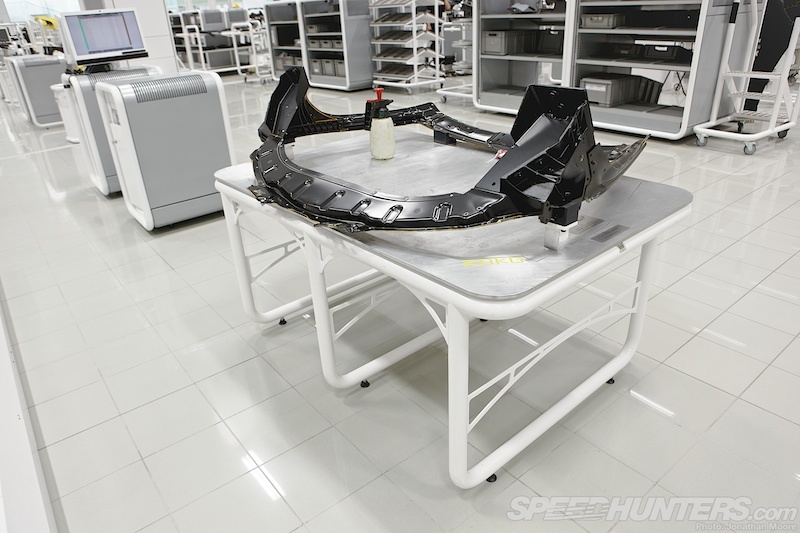 … and the remaining bodywork it was missing is assembled on a separate sprue that follows the car through the first line of the paint shop. 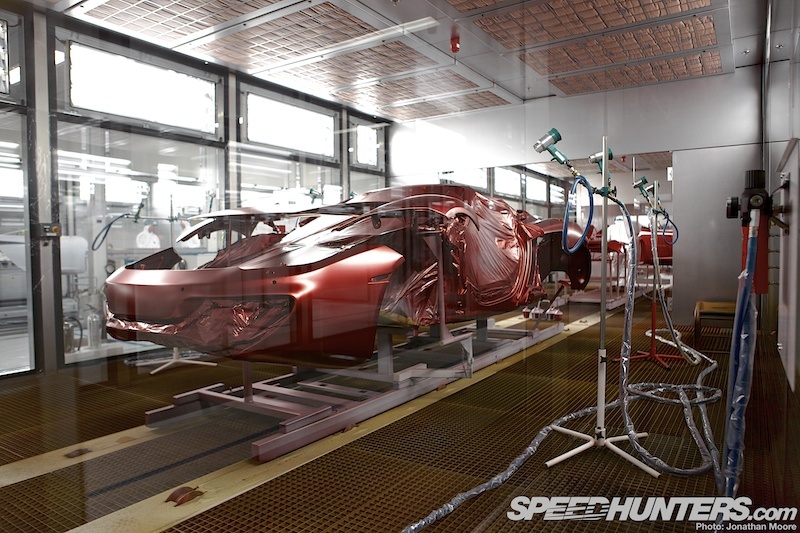 … before being moved into a more controlled environment for detailed surface checking before painting. Which is where the fun begins! 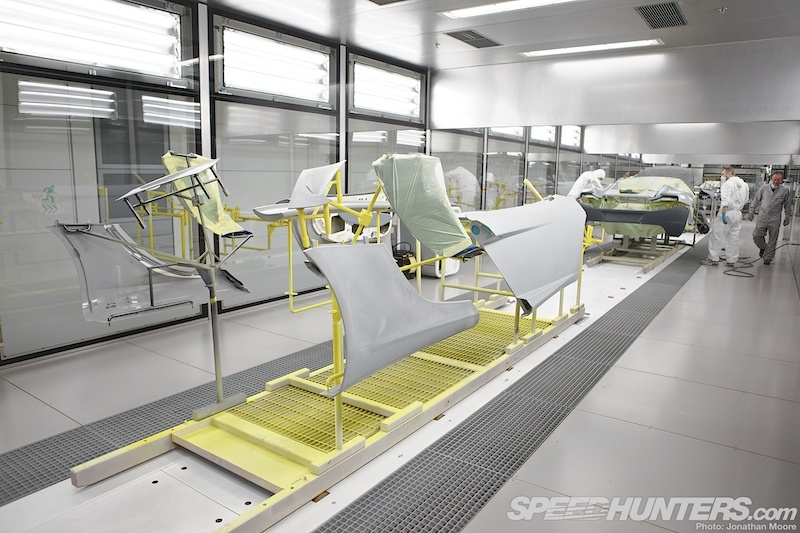 The cars reverse direction and go through three separate paint chambers for each coat to be applied. 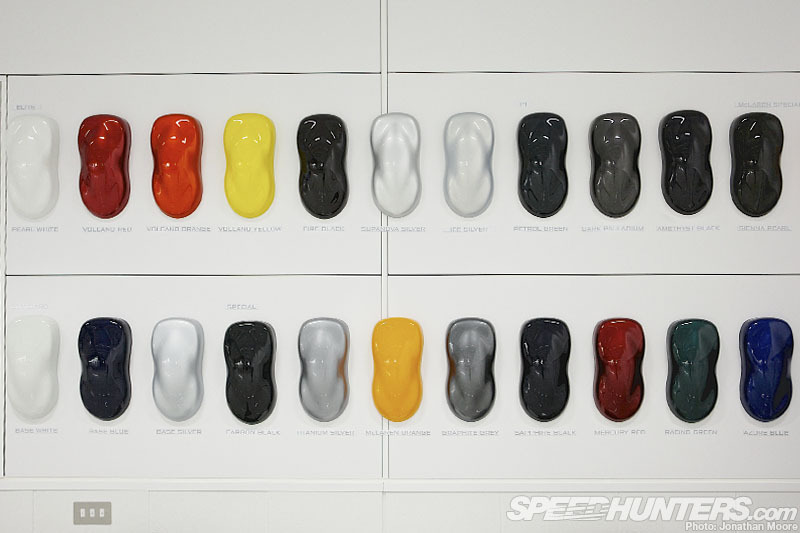 Normally batches of cars that are the same colour are aggregated together for sequential painting. 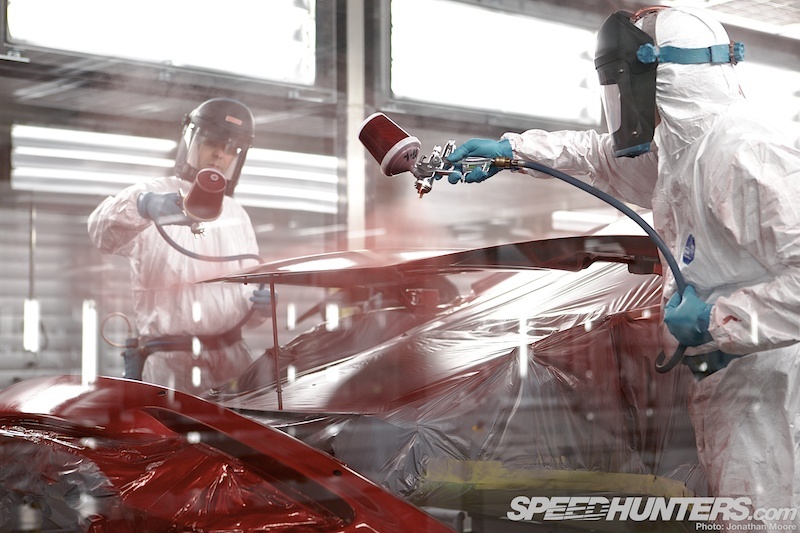 Watching the painting process was mesmerising, like watching a movie decontamination scene. 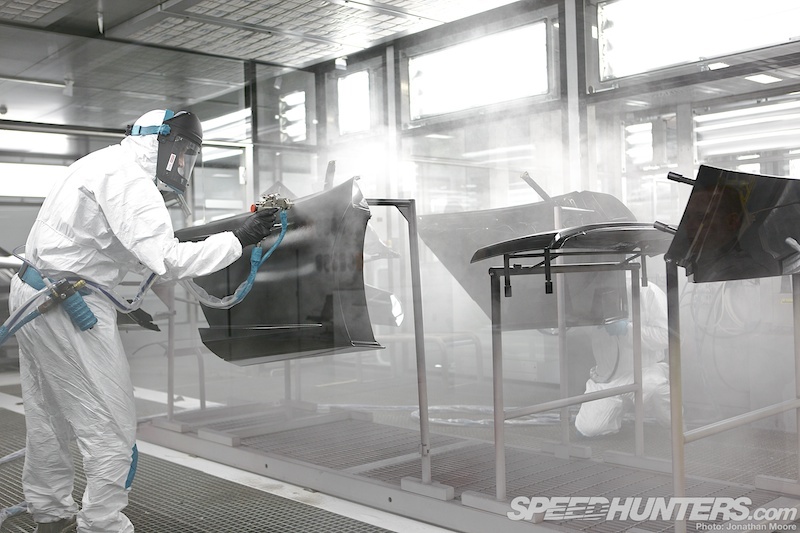 Then, after all those sumptuous layers of paint and clearcoat have been applied, what does the next team do as the cars again proceed to another line? Sand it to hell! As usual, the level of attention to detail is extreme: the bulbs in the lighting array change through three colour temperatures to help the team spot any defects. With the painting complete, the panels are then separated out onto frames, marked with their production number and then wheeled back into the main hall to await later fixing to their assigned 12C. 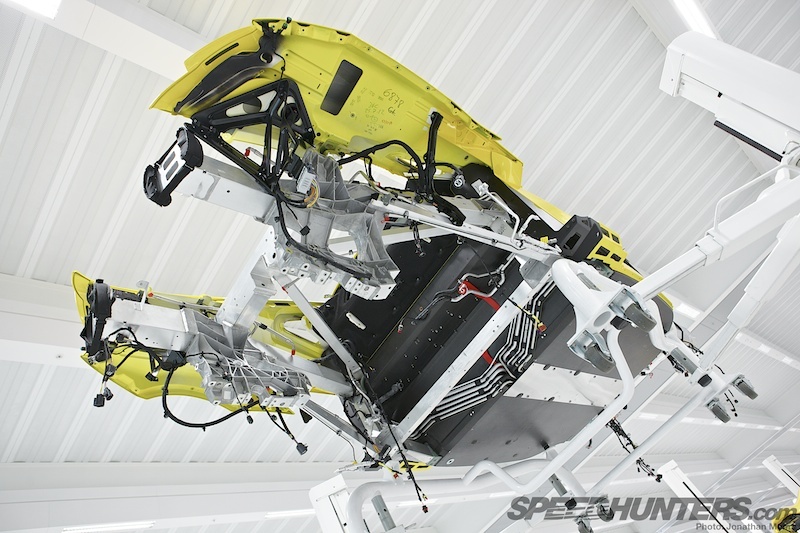 For the 12C chassis themselves, now comes the electrical and mechanical installation leg of their journey. … alongside the first hydraulic lines. 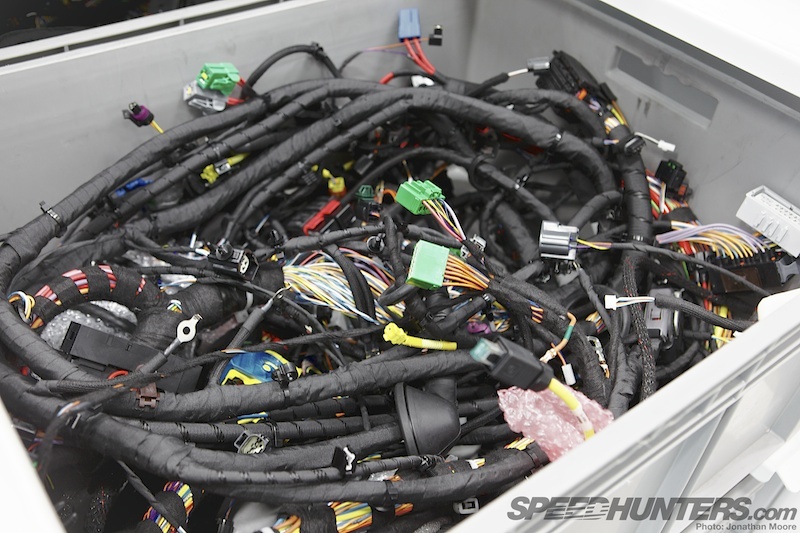 Earthing straps are also run down the inside of the MonoCell, because of the carbon tub. The same timing limit for each station here applies here as it did in body assembly; this must be a phenomenally challenging task. 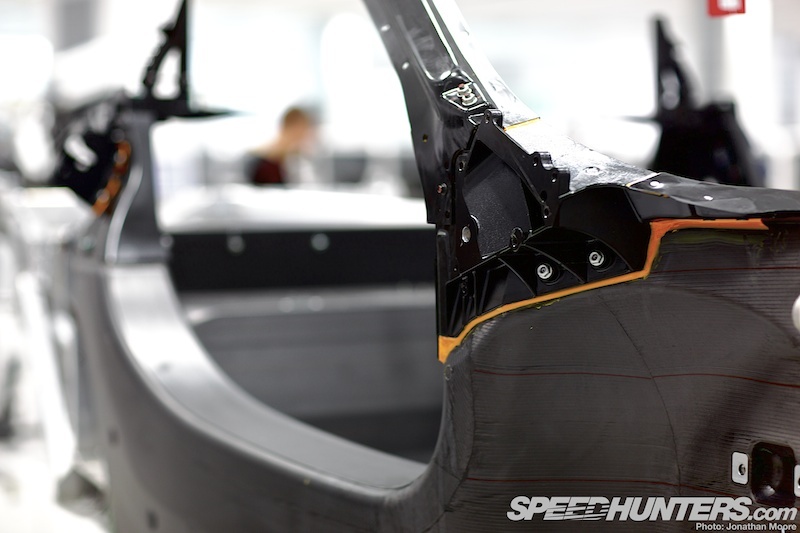 Each corner starts seeing some attention as well, with the wishbones and hubs put into place. 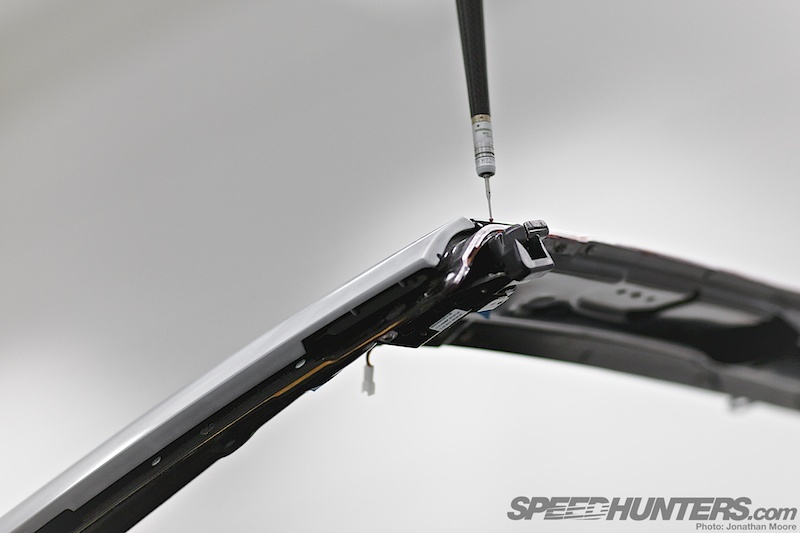 … before being matched up with the aluminium struts and chosen brake callipers, and then fixed into place. 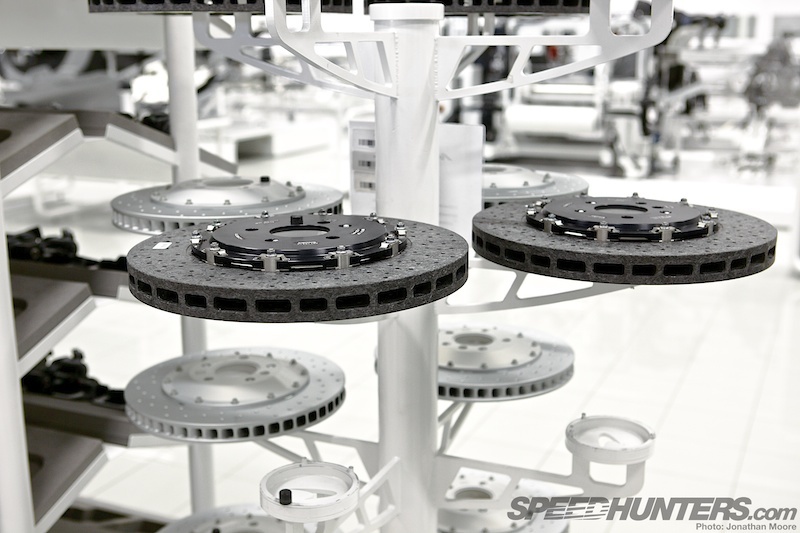 The suspension is purely passive, but highly tuned for different handling using accumulators and diaphragms to control pressure in the system. 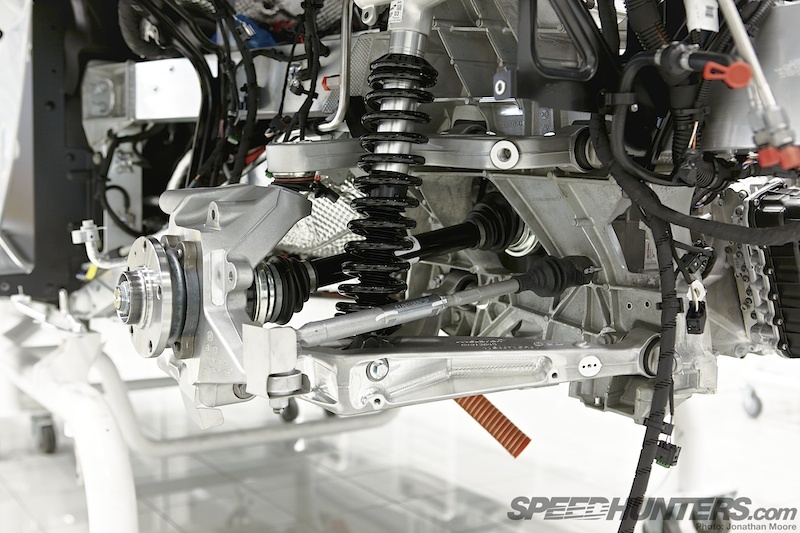 A single hydraulic pump controls the power steering and suspension. The interior also starts coming together at this stage, with the main cockpit surfaces installed and the core dashboard elements. 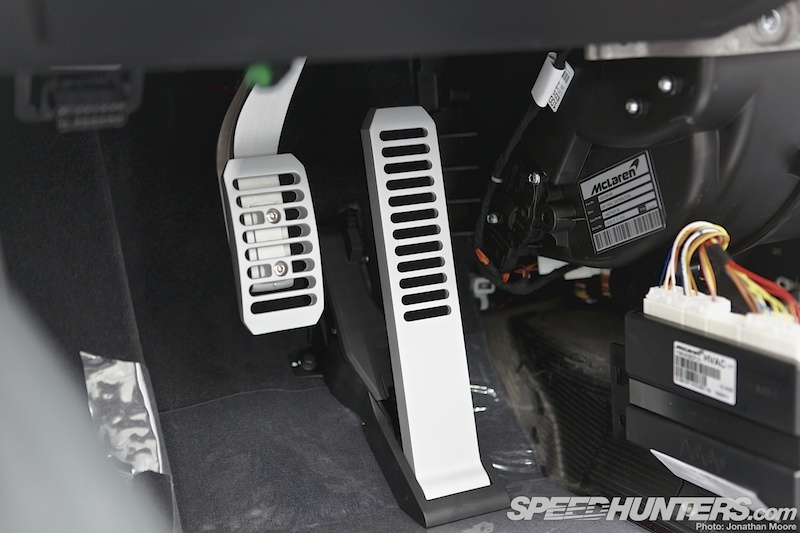 The pedal box also goes in: the P1 uses the same design of billet-style gas and brake pedal. 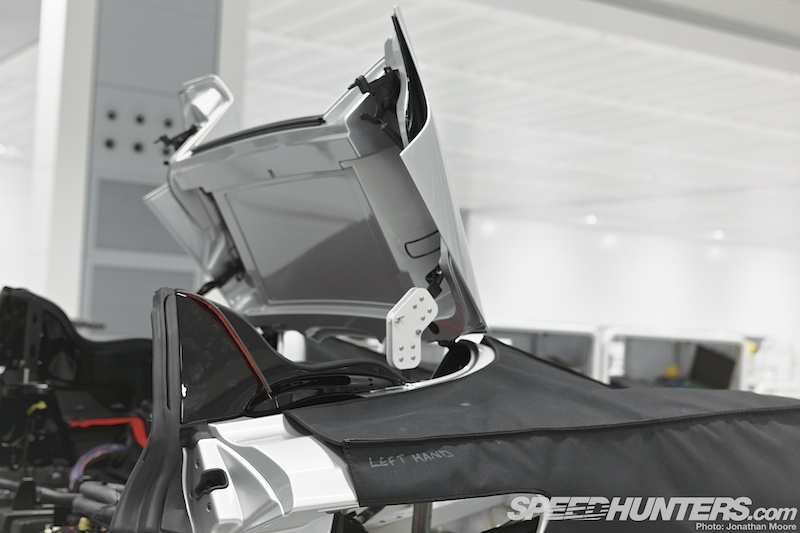 The folding roof mechanisms for Spider variants are also added, with protective covers now applied to all the painted panels. Then, from the tech cave downstairs, the most important part of the nascent 12C arrives: its twin-turbo V8. That’s plumbed into place, along with gearbox and ancillaries, which is delivered to the build station as a complete package. 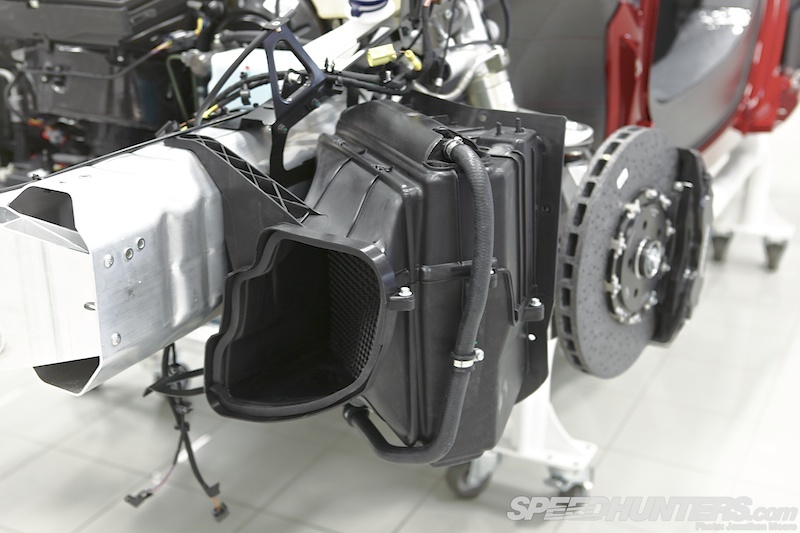 Every aspect of not just the build but also future maintenance has been considered: with a mid-engine a belt change would normally mean having to take the engine out. 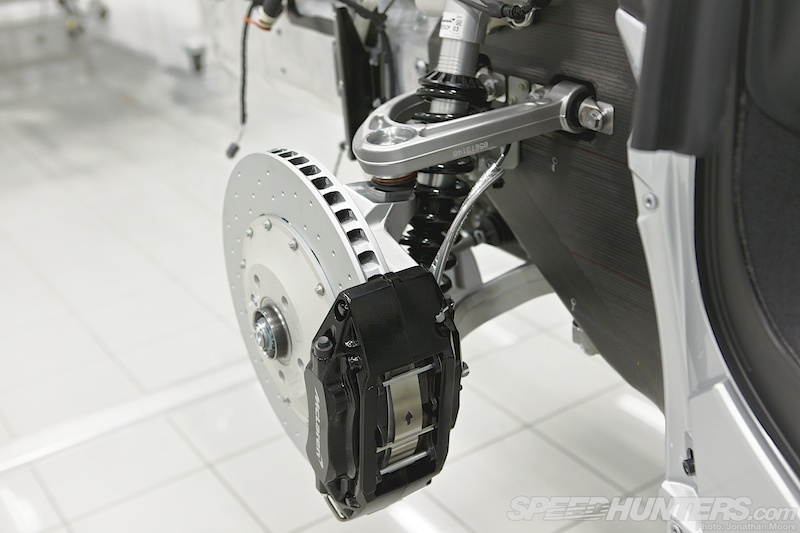 But with the 12C the timing is with a chain, and all the parts that would normally be belt-driven have been moved to accessible areas on the underside of the engine. 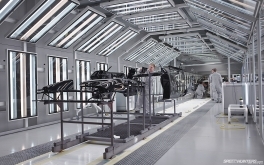 In this line of stations, the cars have really gone from empty shells to being virtually mechanically complete. 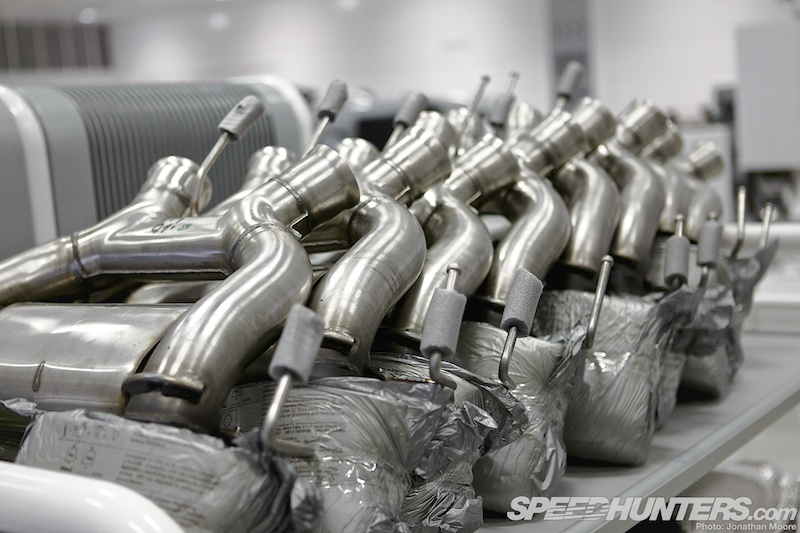 The high-level exhausts come next. 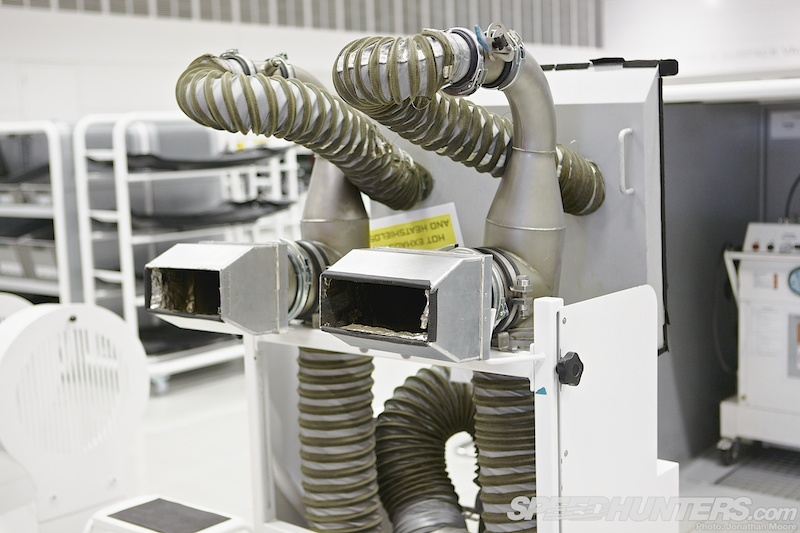 … with an acoustic tuning box sitting between the twin exhausts on the Spider to slightly change the exhaust note. Also, you can see here how short the piping is: reducing lag was a primary concern so the intake path is carefully designed. 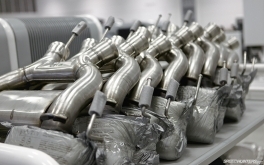 The small turbos sit at either shoulder, drawing in air from the rear window intakes, going through the filter to the turbo, back through the charge coolers and into the throttle bodies. 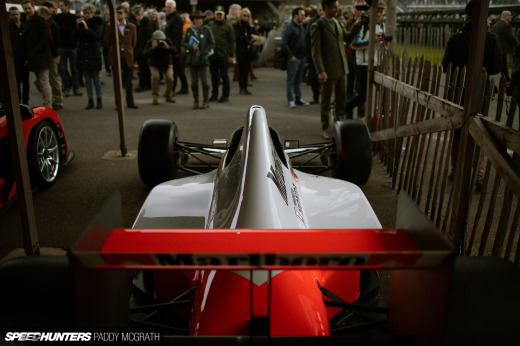 The exhausts are then similarly short. 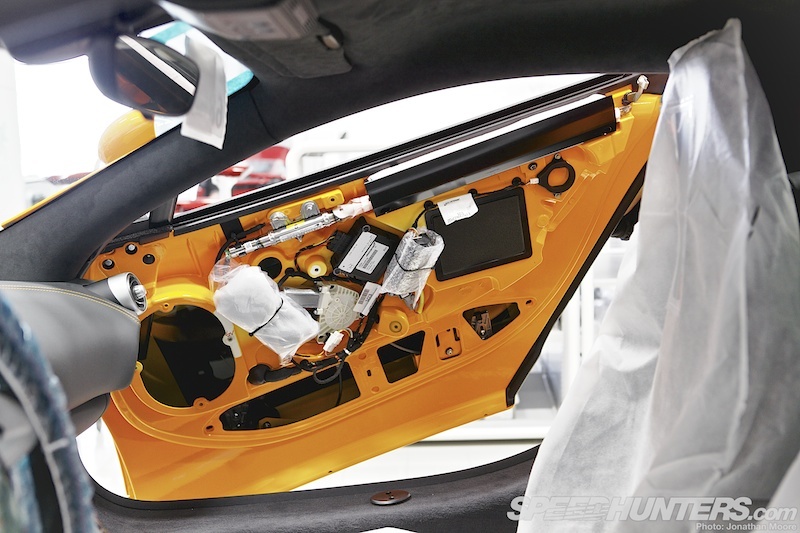 The obsession with weight reduction is overwhelming: the 12C’s battery is 10kg lighter than a regular unit, for instance. 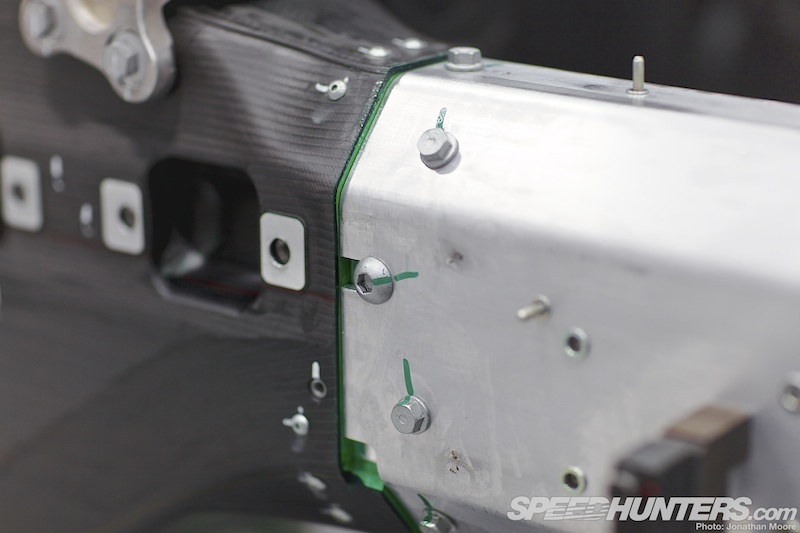 For the rear air brake, rather than using separate motors a feed is taken from the gearbox oil and the pressure is used to push the brake up: then airflow holds the wing in place. 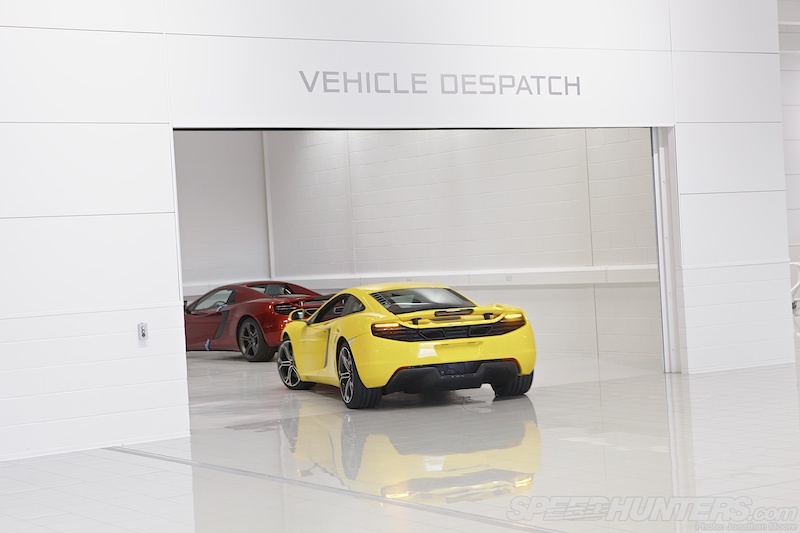 There’s now a glorious moment for every 12C: the inaugural firing up of the V8. 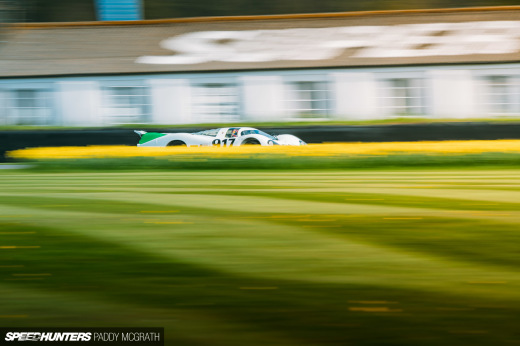 Connected to vents, the V8 is taken through a series of tests. The 12C uses front-mounted chargecoolers to keep the turbo intake temperatures down, with the regular radiators at the rear. The cars now reverse direction again for the fitment of the final panels, electrics and detailing. … the swing doors installed and their electrics wired in before trim fitment. Then all that’s left is for the front and rear bodywork to be added. Over the next three stations the cars get closer and closer to the finished product before the penultimate addition: wheels. And with that, the 12C touches the ground and fires into life as a virtually complete car. The carbon splitter and diffuser are installed and the wheels aligned, but things are still far from over. Now comes an entire line of in-depth testing and verification. … followed by the monsoon test. Every car gets a road test before sign-off, McLaren’s squadron of test drivers taking each taped-up 12C out on the local roads. This creates the strange sight of these black and blue-edged cars doing mundane things like being stuck in traffic or filling up at the local petrol station. 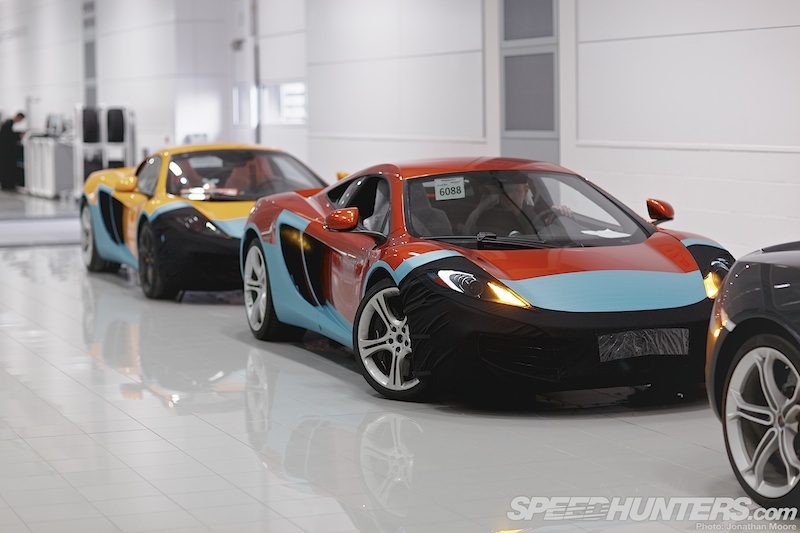 Customer wheels and undertray are removed and test rims fitted for this journey; a subjective view of whether the individual 12C matches up to what’s expected when driving a McLaren. 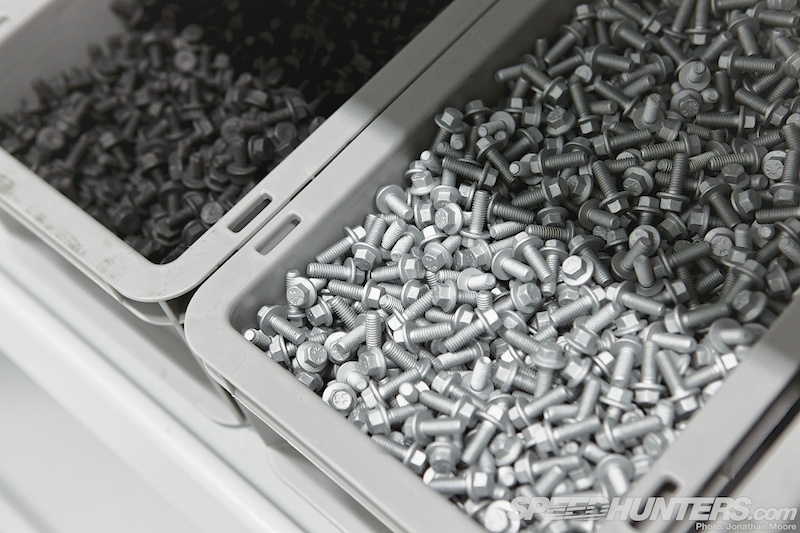 … polished yet again and the undertray and final rims remounted before the last round of quality assurance. The closer to the end, the more thorough the checks. Headlights are adjusted, paint finishes examined and every shut-line measured to ensure that they meet the quality threshold. … where it drives through to be picked up by a transport company and shipped to one of the 30-odd dealers around the world. So after three and a half weeks of loving construction, eight 12Cs a day make their way into Vehicle Despatch and then on to their lucky new owners. 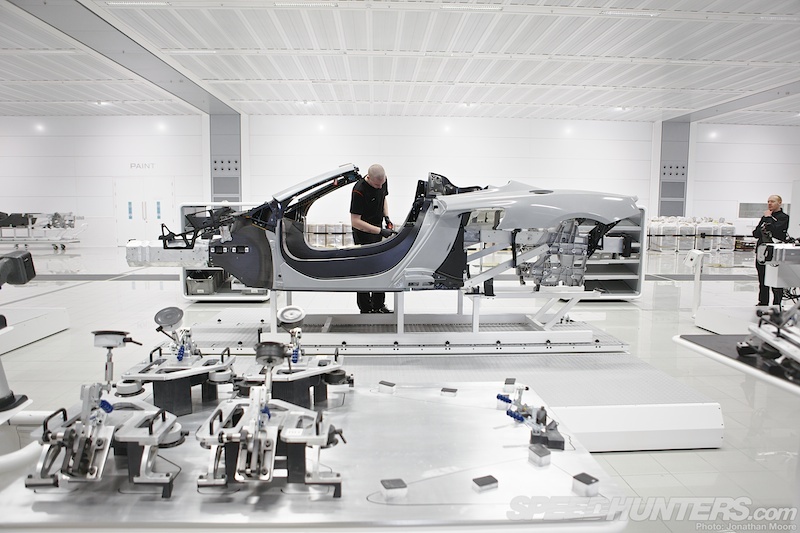 The MPC takes car construction to a completely new level, with an approach to making bespoke supercars on an industrial level that doesn’t lose that hand-crafted feel. 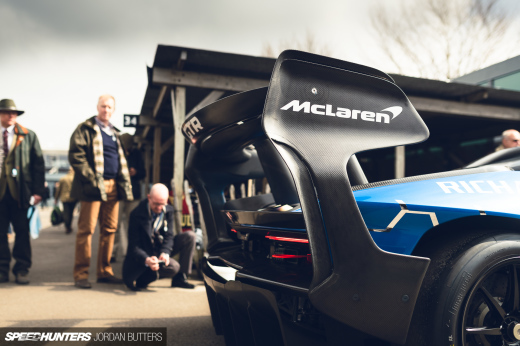 It’s quite a feat – yet because it’s McLaren, is it really that surprising?